Welcome John Payne fans; enjoy this interview (including a world exclusive on Payne’s new album title) & visit our Celebrities in Disgrace film website. 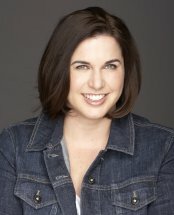 An award-winning screenwriter at international film festivals and labs, Caitlin McCarthy has two feature films in development: “Wonder Drug” with director Tom Gilroy (“Spring Forward”); and “Resistance” with director Si Wall (“The Dinner Party,” premiering November 2010). She also has a TV series treatment, “Free Skate,” which is currently being considered by top production companies. After my blog post about supergroup SCRAP METAL went live on this site, I received an email from the manager of rock star John Payne (ASIA Featuring John Payne) – and my first celebrity interview was born! John was down-to-earth, compelling, and a true gentleman during our near hour-long chat. John Payne has had an amazing career. He became the frontman of the supergroup ASIA in 1992 at the invitation of keyboardist Geoff Downes, replacing vocalist/bassist John Wetton. ASIA extensively toured the world for the next 14 years performing new classics and old favorites. 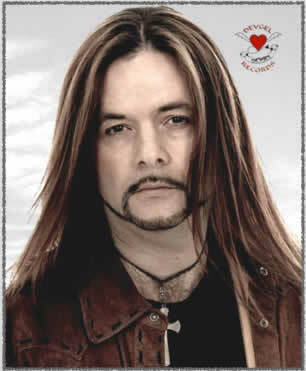 With John Payne fronting the band, ASIA released eight stunning studio albums and several live recordings. In 2006, Geoff Downes left the band to reform the 1982 line up for their 25th anniversary. 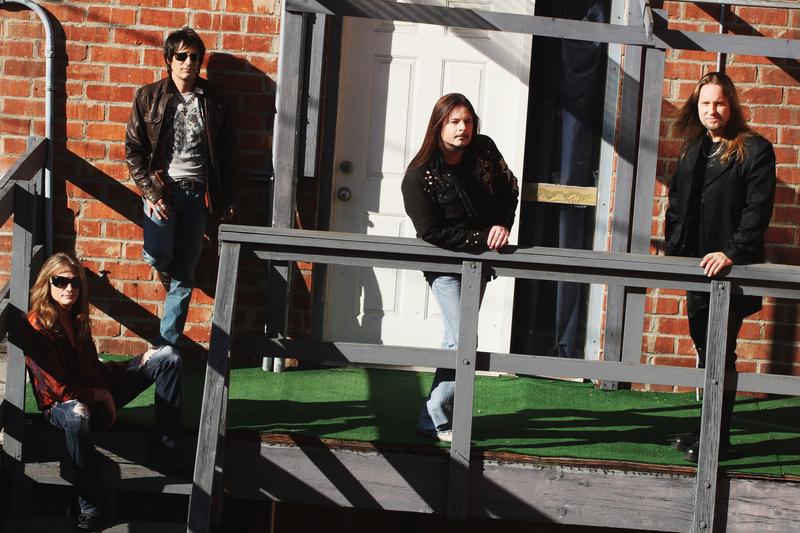 On May 9, 2006, John Payne, Geoff Downes, John Wetton, Carl Palmer and Steve Howe contractually agreed that John Payne would continue his 14 year legacy with ASIA as ”ASIA Featuring John Payne.”ASIA Featuring John Payne have commenced touring in North America and a new studio album is planned for release on Steve Vai’s label Favored Nations in the near future. The interview below contains the name of the new album – you heard it here first, a world exclusive! Caitlin McCarthy (CM): You have a long and distinguished music career. What was your big break? John Payne (JP): My first break was working with Roger Daltrey. His producer Alan Shacklock heard me singing locally, and we got to talking. He said, “I’m producing this singer. Would you like to come over and do some backing vocals?” Then when he told me it was Daltrey, I was over the moon – which is fitting, because the album was called “Under a Raging Moon” [one of Roger Daltrey’s solo albums]. This really helped moved me along because I then got involved with Roger Daltrey’s manager. This helped propel my career. CM: Early in your career, you toured with the biggest acts in the industry, such as KANSAS, Peter Frampton, STYX, Paul Rodgers, DIO, URIAH HEEP, NIGHT RANGER, THE FIXX, BERLIN, THE OUTFIELD, Ted Nugent, and David Lee Roth. What was the best advice someone gave you about the ins and outs of the music business? Don’t do it! (John laughs.) Someone once said to me, if you want to do this, it’s a real rollercoaster. You have money, you don’t have money, you have success, you don’t have success. The best “advice” I actually got was by watching other people and knowing that you can have an extraordinary amount of talent, but you also have to work at it. A lot of people think many musicians just go out and play and record a little bit of whatever, but it’s a full-time career. I’m working seven days a week in the studio. The only times I’ve had off have been for tour, and that’s been for the last year or so. Successful people, in any genre from pop to heavy metal…it’s not just luck. Luck does help a bit. It helps a lot. But they also need to keep themselves going through sheer hard work. Anyone who’s really successful works really hard. CM: Can you share any crazy tour stories? You can omit names to protect the “guilty”! JP: I have quite a few. One of the best stories…a guy from IRON MAIDEN told me this. They were touring in Australia and they were going from east to west, which is a really long drive. Basically, in the middle of Australia, there’s nothing. The tour buses have “roo -bars” in front of them – that’s basically to knock kangaroos out of the way. So they’re going down this dusty freeway and they kill a huge kangaroo. The band decides, because the thing has a broken neck or something, that they want their picture taken with it. So they get off the tour bus, and the driver takes a photograph of the band with the dead kangaroo that’s wearing an IRON MAIDEN tour jacket. And then all of a sudden, the kangaroo shakes it head and bounces off with the IRON MAIDEN tour jacket. Turns out the kangaroo wasn’t dead – it had only been unconscious. CM: With regard to DIO, you sang “Heaven and Hell” as a tribute to Ronnie James Dio at his memorial service, at the request of his family. That must have been incredibly moving for you. What are some of your favorite memories of Ronnie, as a person and a performer? JP: As a kid, I remember listening to RAINBOW and this huge voice, this guy singing “Man on a Silver Mountain.” And from that day on, I was hooked. Ronnie was one of my main influences. I really love his operatic, powerful voice. I so was honored when Wendy Dio asked me to sing at his memorial and, even more so, the day before at Ronnie’s funeral. Man, that was hard. I sang a song called “Rainbow Eyes,” which Ronnie wrote for Wendy. I knew how important it was and I sang it ten minutes into the service. It was very nerve-wracking because, along with the emotions of everybody and myself, everybody there – about 250 people – were all famous musicians, managers, and agents. It was very difficult. The memorial the next day was more of a celebration of Ronnie’s life. I actually learned things about Ronnie that I didn’t know, like he started off as a trumpet player. He had an extraordinary life. Ronnie really was a good guy. He knew what he wanted, he did it, he traveled all over the world for charities. He spent a lot of time with a charity called Children of the Night. Everybody loved Ronnie. If he was involved with something, it would attract a lot of people. CM: You became the frontman of ASIA in 1992. How did that invitation change your life? JP: I was a fan of the band, and all of the bands that the guys had come from. I had just previously been asked to be in ELO, after Jeff Lynne left the band. That didn’t transpire because there were loads of legal things going on with the name. But I did get up to the stage where I met with Jim Steinman who was going to be producing the new album. When I got back, that’s when I was asked to join ASIA, which was much more suitable for me. It really did change things in my life. ASIA was a supergroup. It was great, but I had to do a lot of work. They had a huge catalog. It wasn’t something where I could grow into the role. I had to be off and running. We had an album due and a tour. And there I was. CM: Tell me about the upcoming ASIA Featuring John Payne album. What can fans expect from it? When will it be released? JP: I’m working on it at the moment. It’s been a longer process than previous albums. There’s been touring and the Dan Brown book project [see the “The Architects of Time,” a new musical venture where John Payne and a host of guest stars perform tracks inspired by some of the themes and topics in Dan Brown’s The Lost Symbol and Simon Cox’s Decoding The Lost Symbol]. I expect to finish the album in about four to five weeks, and then we’ll talk about releasing it. It really is a labor of love. The new album, which you are the first to know, is going to be called “Americana.” We’re going back to our albums starting with an “A” and ending with an “A.” I’m looking at the artwork right now. It should be a very interesting album. It’s been a long time since we put an album out. It’s well waited. CM: Any special guests on the new album? JP: There will be a couple of special guests. But it’s pretty much the four piece band, and very much in the ASIA tradition. CM: I recently watched you blow away the audience with SCRAP METAL at Mohegan Sun in Connecticut. Are you focusing most of your time now on the new album, or can fans expect any more live performances from you? JP: My focus at the moment is on the new album. We have to get this finished. Once we’ve done it and there’s an official release date, we will tour worldwide – work our way around Europe, Japan, and the U.S. But I imagine the lion’s share of dates will be in the U.S.
CM: Tell me about your involvement with SCRAP METAL. How did that come about? JP: I really, really enjoyed it. Such good fun. I got a call from one of their representatives, who asked if I wanted to do it. Thereafter I got in touch with Gunnar [Nelson]. Matt [Nelson] and Gunnar are really, really cool guys. It’s very important to work with people who are likeminded, who act professional but also have fun. Matt and Gunnar don’t take themselves too seriously, but they take the music seriously. CM: You’re a founding and current member of modern progressive rock band GPS with Guthrie Govan and Jay Schellen, who are also members of ASIA Featuring John Payne. Will the next GPS album be recorded after the new ASIA Featuring John Payne album? JP: We have a record deal with InsideOut Music in Germany. That will be my next project, to get that record done. GPS is progressive, darker, and heavier – it’ll be more of a player’s album. CM: How has your recording process evolved over the years? JP: The four of us get together and cut the tracks. I have a recording studio in Los Angeles and I mix it there. “Evolved” is really the wrong word for the recording process. It’s more “changed.” I’m really happy that I grew up watching engineers and producers. I witnessed them working and use some of those “old style” methods in my own work. CM: Who are some of your musical influences? JP: I listened to singers like Sam Cooke, Otis Redding, Marvin Gaye, Ian Gillan, Ronnie James Dio, Steve Perry, and Paul Rodgers. DEEP PURPLE was a big influence for me. CM: What was the first record you ever bought? JP: You know, it’s really funny you say that. My first girlfriend, she bought…the two records that she played at her house all the time were David Cassidy and THE CARPENTERS. CM: (Laughs.) Here’s something else that’s funny. David Cassidy played Mohegan Sun the night after you played with SCRAP METAL. JP: David co-wrote an ASIA song. He [and his wife Sue Shifrin] wrote a co-song with John Wetton called “Praying for a Miracle,” which is a really good song. David’s a very talented guy. CM: Who are some of today’s artists that you enjoy? JP: I like MUSE. They’re carrying on the old style rock ‘n’ roll. 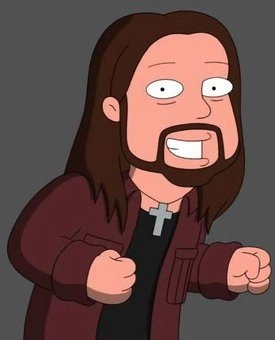 CM: My young nephews know who you are because your likeness was used in an episode of Family Guy (“The Splendid Source”). How did it feel, seeing yourself as a cartoon character? CM: Have you ever wanted to be an actor? JP: You often see actors becoming singers, and singers becoming actors. I’ve been approached for a couple of things. Three years ago, I played the part of Parson Nathaniel in the touring production of Jeff Wayne’s Musical Version of The War of the Worlds. I had to actually act and sing, which was a big change for me, but I thoroughly enjoyed it. I’m really good at a lot of English accents. I wouldn’t mind doing something as a Cockney or something like that. CM: You were inducted into the prestigious Rock ‘n’ Roll Fantasy Camp’s Hall of Fame. Past celebrity attendees have included Roger Daltrey (THE WHO), Steven Tyler (AEROSMITH), Slash (GUNS N’ ROSES and VELVET REVOLVER), Bill Wyman (ROLLING STONES), Vince Neil (MOTLEY CRUE), Paul Stanley (KISS), Meat Loaf, Joe Walsh (THE EAGLES), and Bret Michaels (POISON). I only sing in the car, because to sing publicly would be cruel and unusual punishment for everyone. But let’s pretend I signed up for this camp and you got stuck with me. How would you prepare me for my recording session and live performance? JP: The whole point of the fantasy camp is to harness a person’s experience. We can work with people who don’t sing or whatever. We make them feel comfortable, and teach them how they might be able to improve and do something better. People always gain something from the fantasy camp. CM: What is your proudest moment as a musician? JP: My parents spent a lot of time and money sending me to private school. I was a really big animal lover and activist, and I always wanted to be a veterinarian. Then one day I said to my parents, “I don’t want to do it. I want to be in music.” My father said, “Oh, all this money! Do you know the percentage of doing anything in music is so invariably small? You’re just wasting your time.” He was certainly not encouraging me to be a musician. Around 1992, my father – who’s now dead – came to see me play at the Town & Country Club, which holds about two thousand people. It was a very prestigious gig. Harvey Goldsmith promoted it. My father had a perfect seat in the balcony, in the middle. After watching me perform, he said, “You did the right thing.” That was the biggest moment in my life, really. CM: What are your interests other than performing? JP: In England, I had a studio. We recorded artists like Duran Duran and Oasis. I had four parrots there, four ostriches, four pigs, a goat, three dogs, a cat, ferrets, geese, and two horses. Now, obviously, I haven’t got all of that in my apartment in L.A. I just have two cats now. I’m a very sociable person. I live in the downtown area of L.A. I’m basically on my own. I have a big network of friends. I enjoy cycling. I’ve been cycling twenty miles a day for the last three months to my studio. I don’t have much free time. I’m in my studio now. I’ll be here mixing until ten o’clock, same as last night. CM: Do you have any final words that you’d like to share with your fans? JP: The band and I are all very approachable. We encourage people to let us know what they think about songs and where we should be going. I hope fans will continue to support us. I really appreciate the fans every day. For more information about ASIA Featuring John Payne, please visit www.theasiaband.com and www.myspace.com/asiafeaturingjohnpayne. Personal note from CM: Many thanks to Barry Solomon, John Payne’s manager, for reaching out to me and making this interview happen. I had a ball! Excellent interview and I have enjoyed this music for years. I was interested to hear about the new works in progress and hope John P. and Asia keep on rocking. Caitlin did an excellent job in this fun yet probing interview. I was especially moved with JP talks about his father at the end. And yes, the new work sounds cool and I like the title– revealed here for the the first time– AMERICANA. Thank you, everyone, for your terrific comments! The name GPS comes from the initials of the three founders: John Payne (vocals, bass, guitar), Guthrie Govan (guitars) and Jay Schellen (drums, percussion). Check this band out! Caitlin, great job, how did you manage to keep your hands off this guy? I’m totally and unabashedly in love now. He had me at “Deep Purple”. Yes, I was thinking the same thing! LOL– Will let Caitlin handle this one– but I will add that the interview took place by phone and I believe the two parties were thousands of miles apart. I agree; JP comes across as very appealing and I think you won’t be the only one who’ll fall in love! Thanks for the interesting interview Caitlin. Quite an insight. I’m really looking forward to the new albums & the European tour. Brilliant news for us long standing fans. Im sure Caitlin will want to reply too but I just want to welcome a voice from across the seas in UK to our blog. Thanks for stopping by and good to hear from a longtime John Payne fan! So happy that my interview with John is winning over new fans (Hi Wendy!) and giving insight to longtime fans (Hi Liz!). Great to hear from the Source herself– thanks for jumping in, Caitlin. Interesting to know that this interview was done by Skype– I’d somehow missed that fact but it makes sense, given the face-to-face quality of the discussion. Skype will let you make calls without the video element. It’s perfect for when you’re taking notes during interviews! Caitlin, this is awesome. Just loving this… Keep up the great work! !